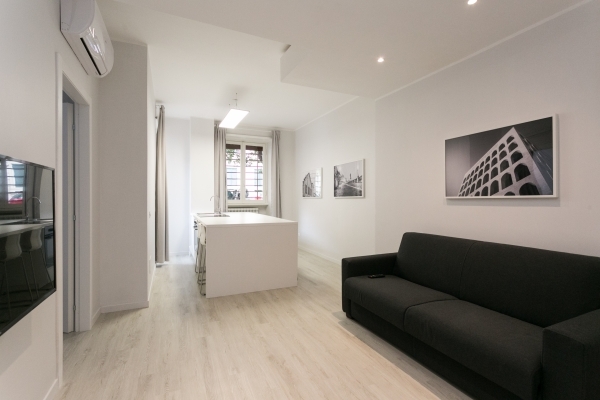 The apartment is in the characteristic and beautiful neighborhood of Prati, in a building of the early twentieth century that overlooks a garden square. You enter the building through grand and traditional double wooden doors and from the entrance hall, you enter a large and spacious living area with kitchen, bedroom and bathroom. The newly renovated apartment (July 2017) has high end finishes and luxurious amenities with new furniture and state of the art technology. The island kitchen is equipped with the latest home appliances complete with high quality cookware, tableware, cooking utensils, coffee maker and toaster. Up to 4 people can be seated comfortably to eat. In the living area, there is a 4-seater sofa (which turns into a comfortable double bed) and a 50-inch high definition TV that allows you to watch hundreds of satellite channels. The bedroom has a double bed, nightstands, spacious closet complete with coat rack and a combination safe, 32-inch high definition TV with satellite channels. The bathroom is complete with large shower (70x160 cm) and bidet. The air-conditioning and heating system ensures comfort all year round. Internet connection, ultra-fast (80 Mbps download speed) unlimited. Bathroom and kitchen soaps, 100% cotton bedding and bathrobes are provided.